Welcome to the Las Vegas Convention Center. What a great place for Expo 2002, the International Transportation Expo. This huge gathering takes place only once every three years. 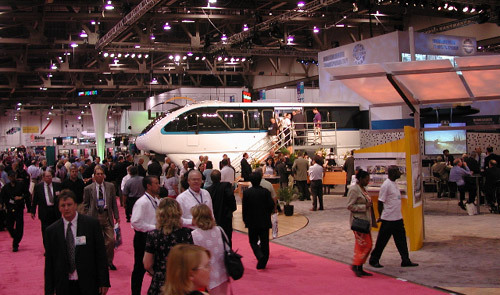 In the past, monorails have been hard to find at the American Public Transportation Association (APTA) event. 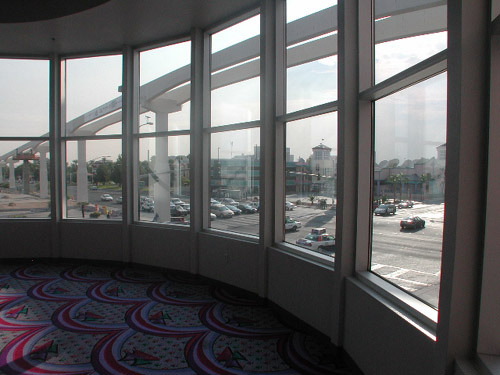 This year, right outside the convention hall front windows monorail was prominent in the form of the Las Vegas Monorail track, which is under construction for a 2004 opening. Here's only a small portion of the hall. A huge assortment of buses, light rail and supplier booths filled the building. This is the Bombardier display. Hmmm, what's that new train there? Although the convention was not an official gathering of Monorail Society members, several were on hand to observe, learn and network. 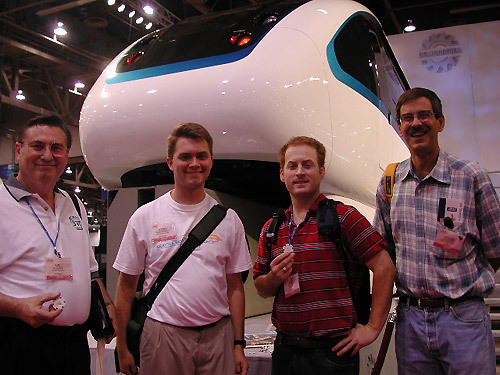 From left to right are Karl W. Guenther of Sky Train, Rodney Rutherford of Seattle's Monorail Campaign, John Crofts of the soon-to-be-famous Ice House Bar (right on the Las Vegas monorail alignment of course) and Gib Hilton, who is authoring a book on transportation. Other members were manning their transportation booths throughout the hall. Let's look at some of the displays we visited. 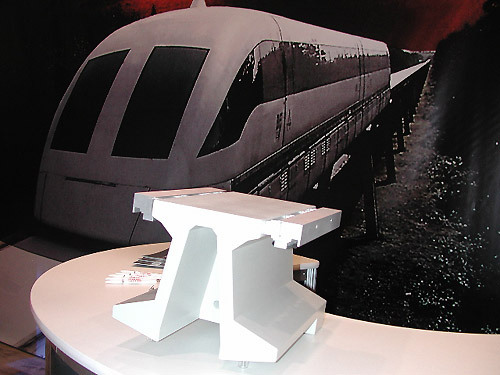 Max Boegl Construction was on hand showing models of the new beam design they constructed for the Shanghai Transrapid line. 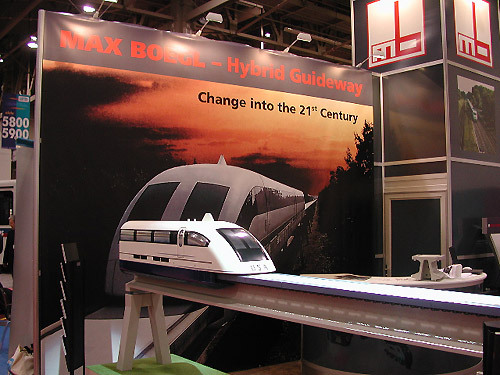 Here's a cross-section model of the new Transrapid guideway shape for Shanghai. The Max Boegl folks were very kind to Gib and I when we visited. We also visited with Larry Blow and the folks of Transrapid nearby. More pictures? Of course, click on "2" below.